Have you ever struggled with keeping your curls healthy? 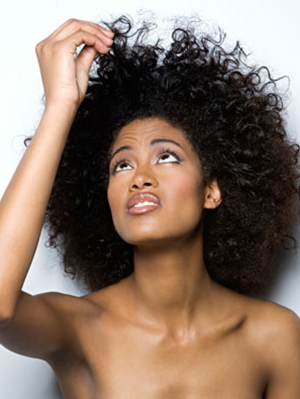 Curly haired girls often struggle with dry curls, or other issues. This can keep them back from achieving the length or control of their curls they desire. Here's 7 easy ways to keep curls healthy. Protective styling can help manage curls by keeping moisture locked in, and protecting strands from the elements. You don't need to go over the top to achieve these benefits. Low manipulation styles work well without putting stress on your strands. Consider twists, updos, and buns for low effort but high result styles. That squirt bottle can be useful for more than keeping your cat off the countertops. Keep a small spray bottle filled with distilled water nearby to give your curls a shot of moisture whenever necessary. You'll want to utilize this particularly during the dry winter months. Leaving curls exposed all night puts them at risk to losing moisture or being damaged by your pillowcase. Opt to tuck curls under a satin cap to protect them. If you can't tolerate a cap, purchase a satin or silk pillowcase to keep curls healthy and well formed. These oils have so many uses, including helping out your curls! To help your curls grow, you can utilize rosemary, lavender, tea tree, and lemongrass oils. Add these oils to your shampoo or conditioner to reap the benefits. Don't start ripping and tearing at the snarls or knots in your curls. Instead, cover up your curls with lots of conditioner and then begin working through each knot individually. Avoid tearing or pulling so you don't break your strands. As tempting as it might be, trying to avoid touching your curls. The more you put your hands into your hair, the more likely you are to disrupt your natural curl pattern and cause them to fall flat. As much as we love using our hair dryer, it can wreak havoc on delicate curls. Instead, allow yourself enough time in your regimen to air dry your strands.